To be in proximity to any NBA franchise during a championship run, for lots of kids in our sports obsessed culture, is a dream come true, especially if you are from the city of San Antonio. 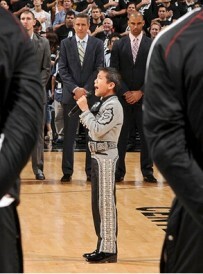 That could be said for mini-Mariachi phenom Sebastien de la Cruz, who sang the national anthem yesterday for game 3 of the NBA finals. A former participant in the show America’s Got Talent, de la Cruz, in many ways, represents the city of San Antonio most perfectly. Of the 1.3 million people who call the city home, 27% are people under the age of 18 and 63.2% are Hispanic or Latino/a (2010). The Spurs or Los Spurs, as they are often affectionately referred to by their Hispanic fan base, are keenly aware of the diversity that makes up the city of San Antonio, the other major ethnic groups in the city non-Hispanic whites at 26.6% and African Americans at 6.9%. They have been successful at cultivating a fierce loyalty to the franchise that is mindful of these demographics. San Antonio is a huge Hispanic market hub that brokers commerce between the U.S. and Latin America, and the Spurs franchise intimately understands this, and goes to great lengths to have the city’s diversity and economic interested reflected in the city’s NBA team. So why are people outraged that 10-year old Sebastien de la Cruz sang the National Anthem in a Mariachi outfit? Simply put, because the figure of the Latino/a child citizen subject bounds with possibility, represents a position of vulnerability, and thus is a potential threat to the nation. Never mind that the city of San Antonio was part of the Spanish American empire until 1821, or that it was part of Mexico until the founding of the Republic of Texas in 1836, or that many of the individuals who fought for Texas Independence were Mexican. As hundreds of tweets referred to him as “the little Mexican kid” or the kid that “snuck in the country like 4 hours ago and now he singing the anthem” we see the vitriol and hatred that have become a response to the shifting demographics in this nation. Not surprisingly, many of the twitter haters were minorities or individuals with Spanish surnames, showing that there is a clear divide about immigration politics and minority communities. If people knew the history of San Antonio, and of Texas, they would know that Sebastien represents both the past and future of the state, one that is simultaneously American and basketball loving and yet tinged with a very real Hispanic past. This young man representing his multiple cultures and experiences were cultivated in U.S. schools, reinforced every time he says the pledge of allegiance, and takes the standardized tests required of school-aged children in Texas. So why is he any different? As the tweets suggest, he is brown, young, a threat, a potential criminal, and not worthy of protection. Instead, these rants against a Latino/a child represent the gendered and racialization of how moral discourses about childhood are not universal. 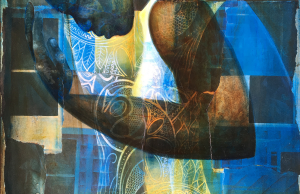 Instead they are predicated on phenotypically ideas of belonging, whiteness, and gender. He is different, a child, and thus a vulnerable and easy target for hate speech. As political scientist Andrew Rhenfield has argued, the UN Convention on the rights of Children demonstrated a need for “participatory institutions [to be] designed to further the interests of children, cultivate their political maturity, and mitigate the harm that giving power to the politically immature might cause.” So while the UN policy is designed to protect the rights of all children, and hopefully foster their entry into planetary society as politically responsible and mature, one must state, that child citizen subject, Sebastien de la Cruz, as a brown Latino/a male child in the United States is not viewed as worthy of the same respect and protection because he, like other Latino/a children are viewed with suspicion. They are the focal point for all sorts of discourses about citizenship, be they the figure of the Anchor Baby, potential illegal immigrant, or undocumented children. So while Sebastian sang his heart out on Tuesday night as a display of pride and the complex history in the making of San Antonio, others saw this as an assault on American values. Instead, I would urge the public to understand the social, political, and cultural factors that beautifully produced a moment like this at the Spurs game. They should also be reminded that the Harvard educated Mayor of San Antonio, Julián Castro spoke at the Democratic National Convention and has turned the city’s economy around. He, Sebastian, San Antonio, and the Spurs deserve our respect, even if we don’t agree with it, for they too represent some of the best things this country has to offer, past, present, and future. Related ItemsHistoryImmigrationLatino/a childrenMariachiMexicoNational AnthemPoliticsRaceracismSan AntonioSebastien de la CruzU.S. Wow…what a great write up. I live in TX. We were very upset with what happened to Sebastien. But we felt it was the ABC announcers fault. The way he was introduced was way off. And for our great Spurs we are used to it. They are never ever reconized around the media. They are team players polite and very respected in our state. We ♥ them. 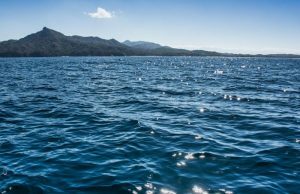 Thank you for a well written article that I hope a lot of people get around to reading!